Yesterday, my husband and I celebrated our four year anniversary. Boy, did four years fly by! When we first got married, I was about to become a substitute teacher due to a lack of jobs available and he was working as a secretary at a huge PT practice. It’s amazing to see how far we’ve come since then! Now I have my own classroom and he is now a PT himself, no longer just a secretary! We have been incredibly blessed and I look forward to seeing where we are at this time next year 🙂 PS: He surprised me with a DELICIOUS dinner at The Melting Pot, this super cool fondue place in Station Square – oh my goodness, it was so so good! Anyways, today I decided to check out the sales at Target. I knew this could be a dangerous thing because I rarely leave that store spending less than $50!! But I love back-to-school shopping, so out I went. Guess what my total was?? $49.91!! Not bad, right? 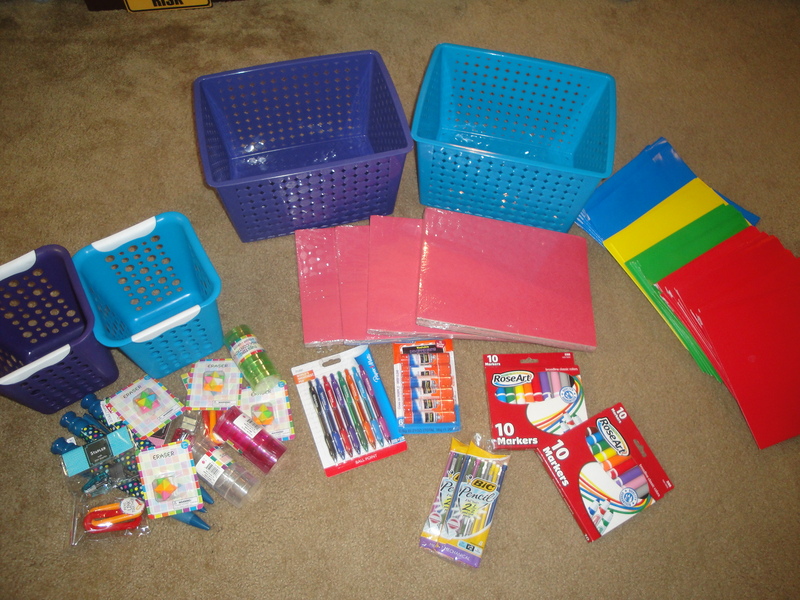 Granted, I did buy a few other things for home…but my goal was to keep school stuff under $50 and I just barely succeeded! So this stuff is for my prize bin at school. My bin had been getting pretty empty and most of the “good” stuff is gone after last year. 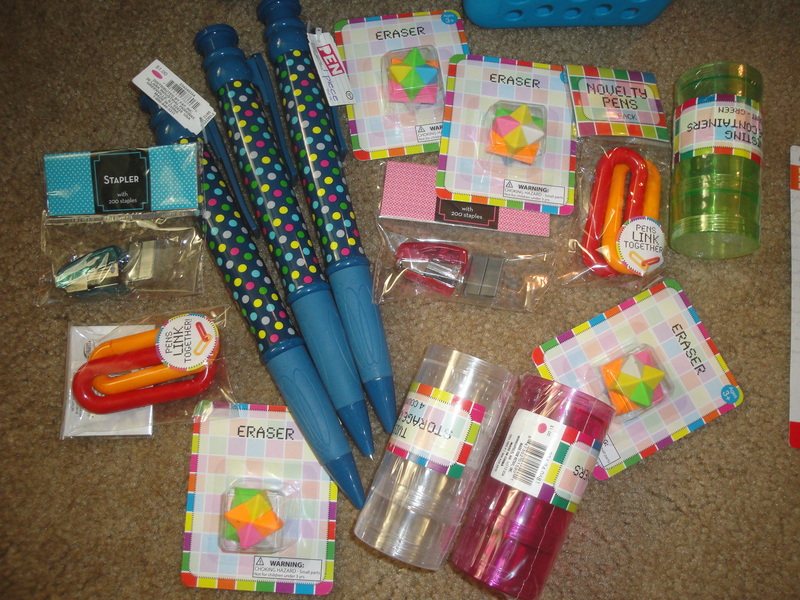 I love the dollar spot at Target which is where I got all of this stuff! This stuff is mostly for me! 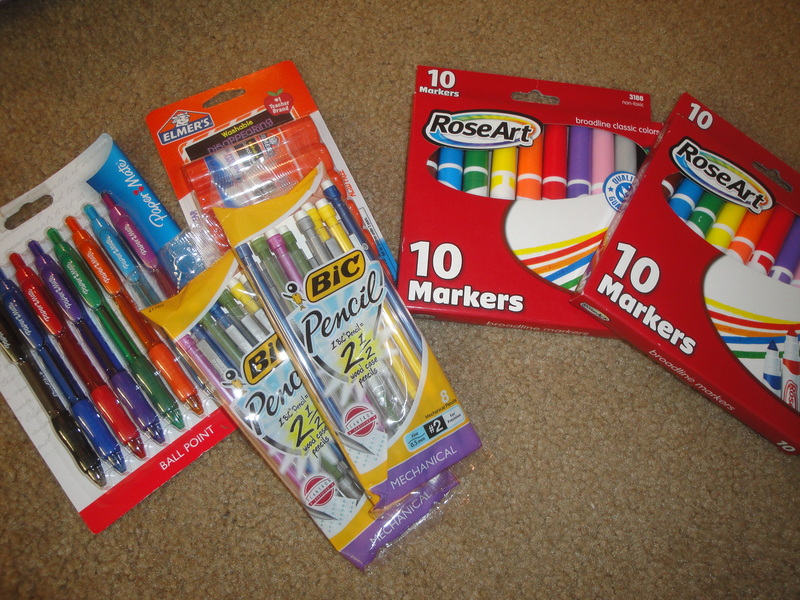 I had a coupon for the PaperMate pens, I needed some new pencils, one of the RoseArt boxes of markers will go in my marker bin (all of our red markers were gone by the end of the year, so I knew I needed to restock) and the other box is for me, and we go through glue sticks like crazy, especially once we get into lapbooking! I always like to keep some in my desk, away from the students 🙂 Everything here was on sale – score! 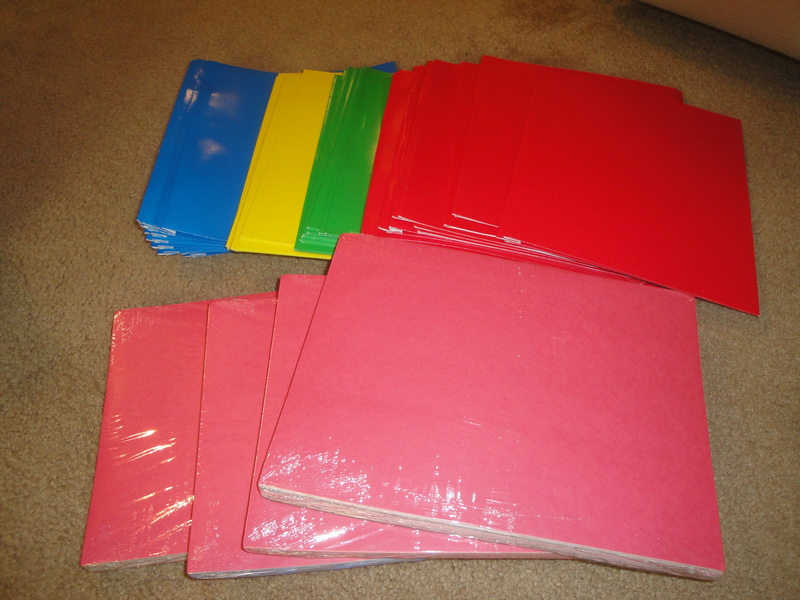 I ran out of construction paper at the end of the year, so I was pleased when I saw it was on sale – I got four packs (with 96 sheets each) for $4 when it would have normally been $7.96 for all four! I give my kiddos folders for each unit topic that we study, so I was able to pick up four dozen folders (I have 11 in my class this year) for 17 cents each…definitely not a bad deal. 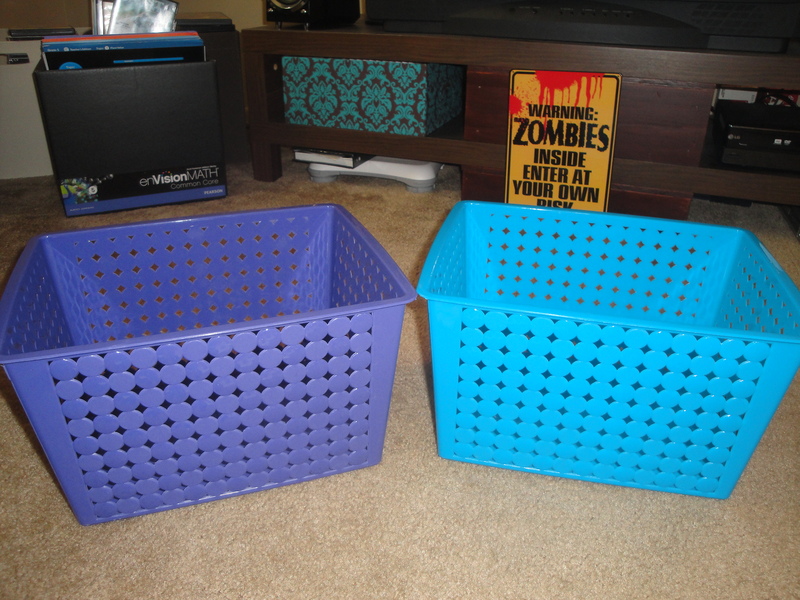 Not sure what I will use these bins for, but they were too cute to pass up! Any ideas?? 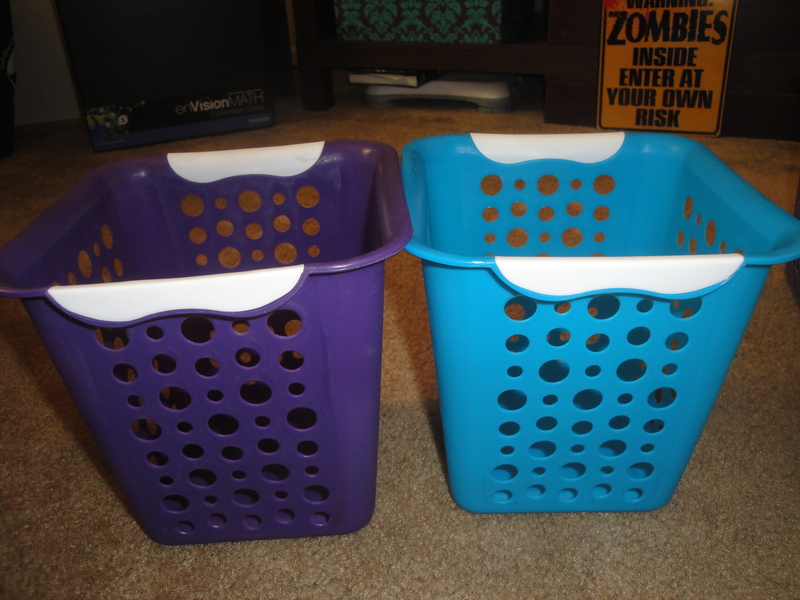 I liked these bins too – they match the smaller ones but are quite a bit bigger and will hold my Language Arts center materials much better than my current bins do. If you look closely at the last picture, you’ll also see my enVision math box in the background. We just received this new curriculum and I have been busy checking it out and determining the best way to use it in my classroom. If you use enVision, I’d LOVE to hear from you!! Have you hit any back-to-school sales yet?? What did you score? Anywhere you recommend checking out?? Today I’m linking up with “Adventures of a 6th Grade Teacher” so that you can learn about a day in my shoes! *6:00 – alarm goes off on my clock. SNOOZE! I shower, get dressed (I always pick out my outfit the night before – this saves me SO much time in the mornings! ), do makeup, sometimes hair (sometimes I spend time on this, though lately with my hair getting so long, I have been sticking up in a ponytail or messy bun), make sure I have everything (keys, cellphone, laptop, etc. ), and get out the door! *7:00-7:25ish – drive to school. It used to take between 15-20 minutes to get to work, however they are doing construction on the main route, so I am going a different way that is longer and has more traffic. Oh well – I enjoy listening to the morning radio shows and thinking about what I need to do when I get to school. I usually spend the first 10-15 minutes at school checking my email, Google Reader, and Facebook (we don’t actually have to be at school until 8:00) while eating breakfast at my desk – usually cereal. *7:40-8:30 – prepare for the day. This involves writing their morning work on the board (usually a review worksheet, cursive practice, silent reading, reciting Memory Marathon verses, or re-reading a story with a partner), making copies that are needed, and mentally preparing for the day! Every Tuesday morning, the staff meets for prayer before the students arrive. The students begin arriving at 8:30 and come anytime between then and 8:45. They do a great job of coming in quietly and getting their morning work done, although sometimes it takes a bit of prompting 🙂 I send a student around with our attendance clipboard at 8:45, and morning announcements over the walkie-talkies happen around 9:00. On Mondays, Tuesdays, Wednesdays, and Fridays, my students and I journey through the Old Testament together. We learn about the Godly men and women and talk about how we can apply what we learn to our lives today. We also do prayer requests and I have a student pray for the class. On Thursdays, the whole school comes together for All School Worship. We sing a song or two, then one of my student’s dads does a short devotion for the school. Four of my students go to 6th grade for math, one student takes 7th grade math later in the day (taught by the 6th grade teacher since we only go up to 6th grade), so I am left with 8 out of my 13 for math. We start every math class by going over the previous night’s HW and answering any questions they may have. During the lesson for the day, the students take notes in their math notebook. We do lots of examples problems together, then the students do some independent work, either in their notebook or on a mini white board. Homework gets passed out at the end of class which students must write down in their HW planner. The students bring a healthy snack every day to enjoy during this time. They can socialize, play games, and just hang out for these 15 minutes. This is my first year teaching English, writing, and spelling, so it has been interesting trying to work out a fairly consistent schedule. We usually do an English lesson until around 10:50, then work on our writing assignment until 11:30. This often changes based on the day; for example, spelling pretests/final tests are given every Monday/Friday at 10:30. Sometimes I do a writing mini-lesson before they begin to work. We are about to begin our next writing assignment on persuasive essays, so tomorrow I will spend a good bit of writing workshop time introducing this to the class and reading some samples together. I also throw in some computer instruction during this time every once in a while. We use Harcourt Story Town for our reading curriculum. Every day’s reading instruction is different! On Mondays, I introduce the vocabulary words and we discuss some background information needed for the story. On Tuesdays, the students do Literacy Centers which I created. 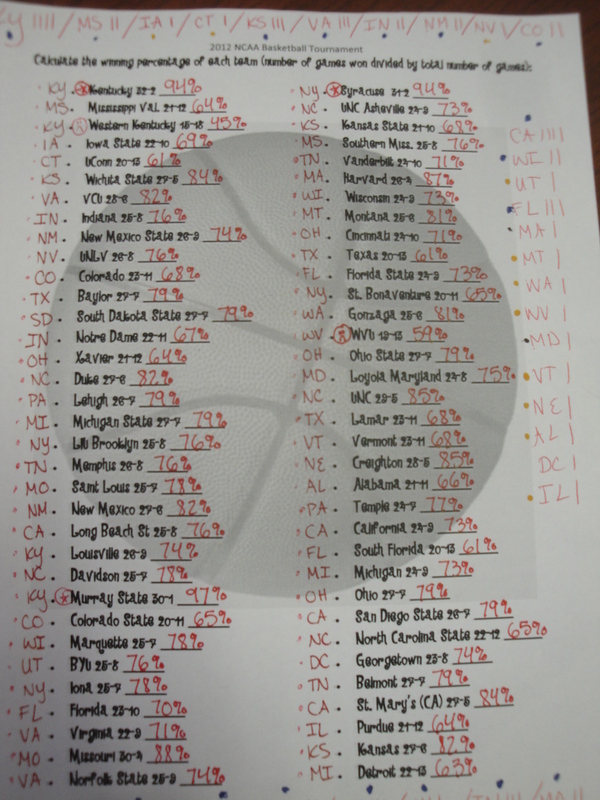 There are 12 centers to choose from and they must pick a different one each week. Maybe I’ll do a post on these in the near future 🙂 On Wednesdays, we read the story for the week and discuss. On Thursdays, we discuss the literary element (theme, conflicts, point of view, or whatever I am focusing on with that story). On Fridays, the students complete a quiz on comprehension of the story, its vocabulary, and the literary element we discussed. We also read a novel each month relating to the unit we study (ex: Sign of the Beaver was our novel for Colonial America), so we spend some of this time reading and discussing the novel. We spend the majority of the afternoon on unit instruction. Every month each grade focuses on a different topic. This month, we are studying electricity and magnetism. Therefore, the bulk of our afternoon is learning about this topic. I love using PowerPoint, so most of my instruction is through PP presentations. Sometimes I have the students fill out a notes page I have created while we are going through the PowerPoint. Sometimes we read books together that teach us more about the topic. 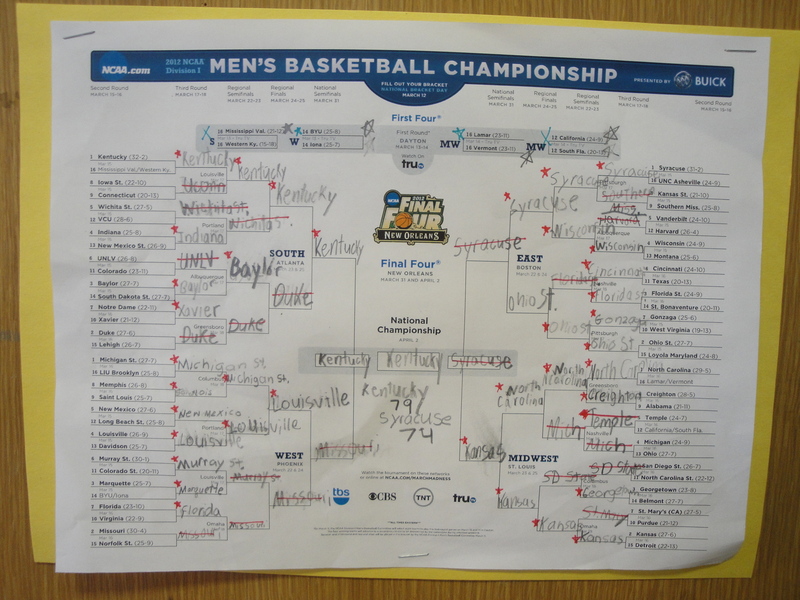 Two of the months we create a lapbook – one of my favorite teaching tools! This month involves a lot of experiments involving static electricity, batteries, magnetism, circuits, and other electricity-related topics. 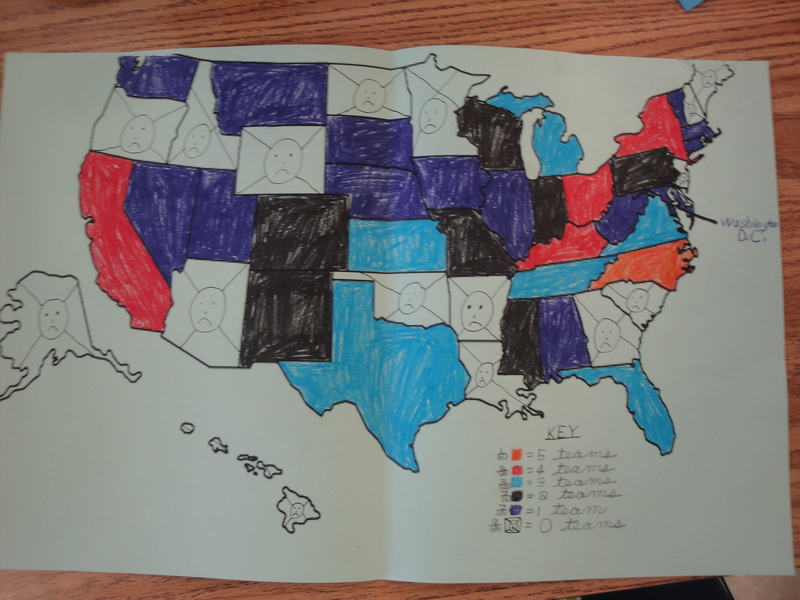 Each month the students complete a project that correlates to the unit. 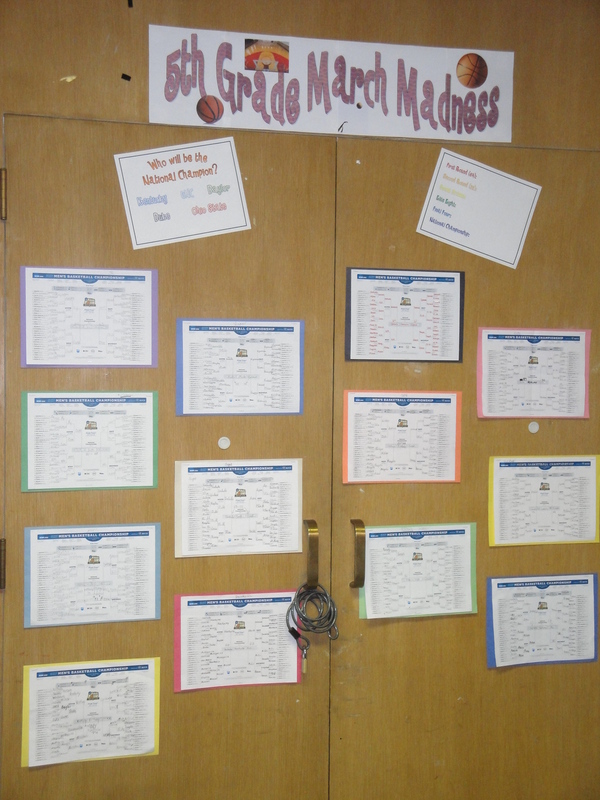 For example, this month they are each planning an electricity experiment to present to the class. They will fill out a form that talks us through their experiment; they will also type up a summary of what they learned, and then present the experiment and their findings to the class. Next month, we will be studying Western Europe, so each student will be assigned a different country that they must research and teach the class about. 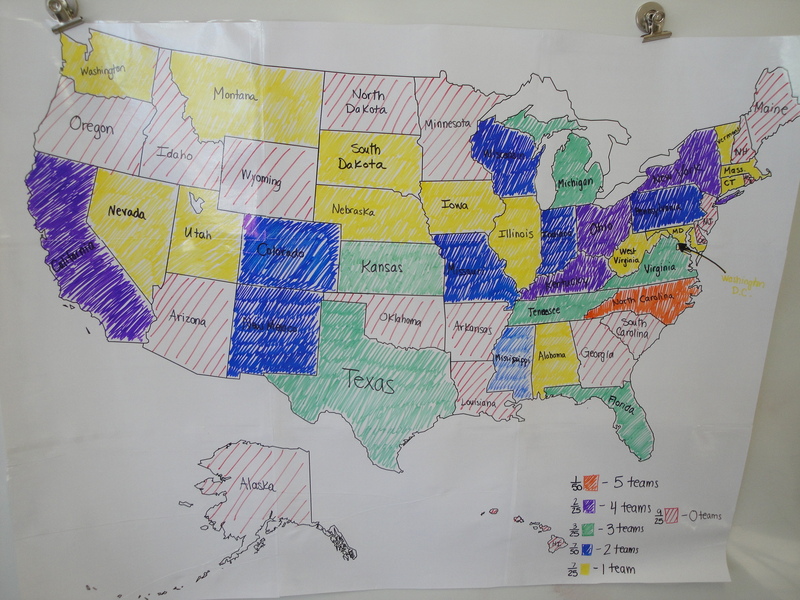 This allows for a lot of creativity because they can teach the class however they would like – through PowerPoint, brochures, posters, books, etc. This is my favorite time of day – the students are always excited about what we are learning! Several days a week we have specials (gym and Spanish) in the afternoon but we always work around those. The students make sure they have all HW assignments written in their planners, they pack up, and I walk them down to bus dismissal. We are allowed to leave around 4:00, so until then I usually prepare for the next day. I try and leave right around 4:00 to avoid traffic on the way home, although I tutor on Mondays until 4:15 and we have staff meetings on Thursdays until 4:15 or 4:30. *4:00-10:00 – enjoy being home! I try and go to bed around 10, although I’m often not very tired so I usually end up reading for a while in bed. So that’s what my days are usually like! Busy busy busy but there is always something fun going on. I’ve enjoyed reading about everyone else’s days too!